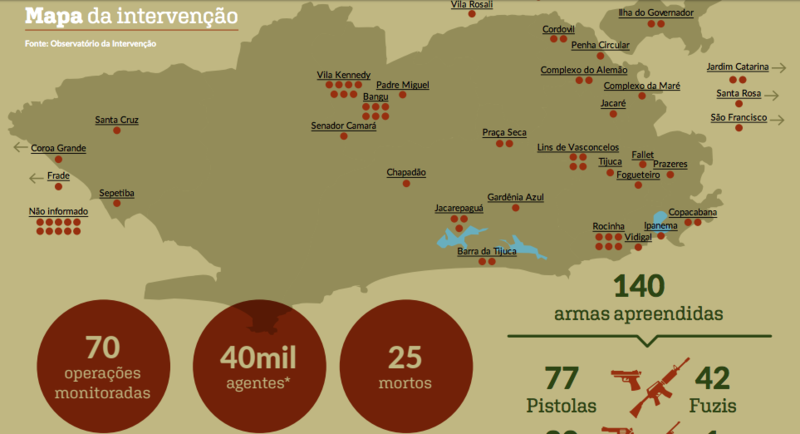 Two months into the (at least) ten-month federal military intervention in Rio de Janeiro, the Intervention Observatory held an event on April 26 to present its first report and launch its new site. 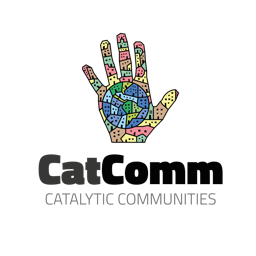 The Observatory is one of several new civil society initiatives formed in order to monitor, critique, or advocate change in the context of the intervention. The group’s report, coordinated by Silvia Ramos of the Center for Security and Citizenship Studies (CESeC), consolidated new data surrounding the intervention and consequently provides a platform for constructive debate with the federal government. 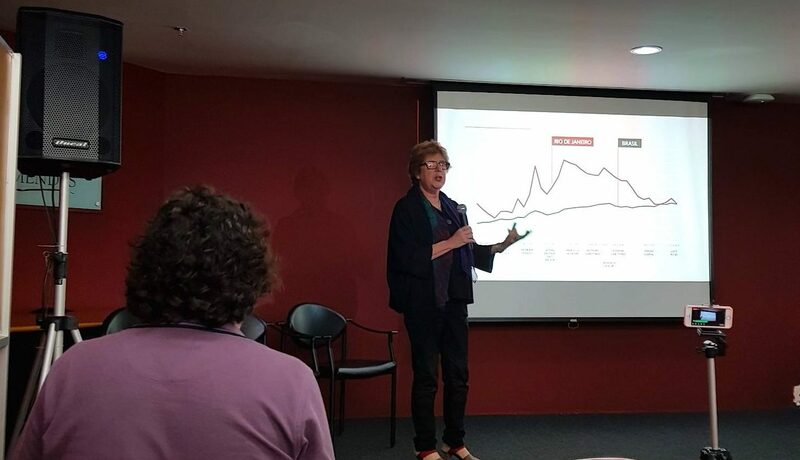 Ramos opened the event by presenting a graph tracking homicide rates in Rio de Janeiro and nationally over the past 35 years. She stressed that although Rio’s rates are down compared to the 1990s, the intervention decreed on February 16 represents the same old model of public security based on violent confrontation that has failed to make long-lasting positive impacts in reducing violence in the city, as demonstrated by the recent uptick in homicide rates since 2014. Such statistics, Ramos argued, are reflective of the futility and inefficiency of the model and how it has created “new problems” instead of much needed solutions. Substitute policies based on confrontation with consistent policies based on intelligence and investigation to unravel criminal structures. Modernize the criminal justice system. Integrate municipal governments into public security action planning processes. The Observatory’s event also featured speakers from institutions such as the Federation of Favelas of the State of Rio de Janeiro (FAFERJ), the violence monitoring app Defezap, and the NGO Favelas Observatory, among others. Amnesty International Brazil representative Renata Neder reflected that one only needs to look at past examples of increased military presence in other states to see clearly that “the use of armed forces has not reduced violence or crime.” Raquel Willadino from the Favelas Observatory highlighted how taking a “critical but also constructive perspective” was necessary in order to help change future policy and respect the rights of those most affected by the violence perpetuated by the military intervention. Cecília Oliveira, co-creator of the Fogo Cruzado app, stressed the importance of collecting and presenting data that has been “systematically ignored by the authorities.” The accessibility of facts through the Observatory’s new site and report, she added, will allow the general public to see “the bigger picture of what is being done” in their city. By aggregating data on shootings around the city, technology such as Fogo Cruzado and data consolidated by the Observatory impede the dangerous normalization of violence around the city. 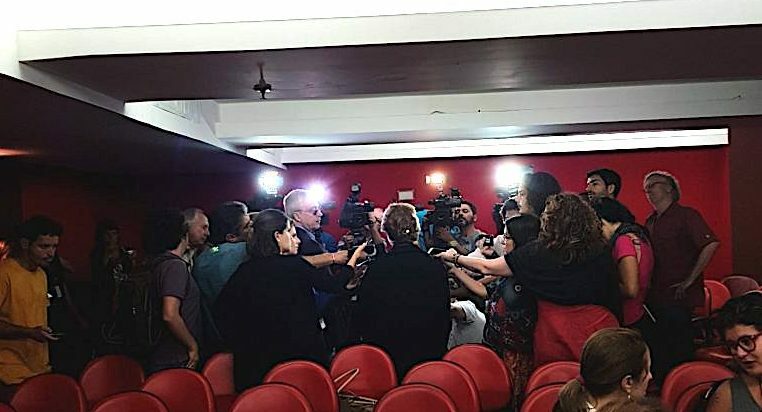 The report presentation came to a close with an important reminder from former Military Police commander Colonel Íbis Pereira that although the military intervention has been going on for just two months, the Armed Forces have been present and active in the state of Rio de Janeiro since August last year. Continuing this way would be “crossing a dangerous line for democracy,” he argued, calling for significant changes to Rio’s public security model. Ramos assured the audience that the Intervention Observatory will continue to monitor and present all data collected, while pushing the authorities for transparency on expenditures and plans for the intervention’s future directions. This article was written by Hari Pannum, and published on May 3, 2018.